Superconductors.ORG herein reports a method has been developed to substantially increase the volume fraction of novel superconductor structures that will not form stoichiometrically. This discovery was made while trying to increase the volume fraction of the 185K (first ambient temperature) superconductor announced in March 2008. It had the unexpected benefit of revealing a theoretical 1256/1212 superconductor with Tc near 195 Kelvin - a milestone and new world record. 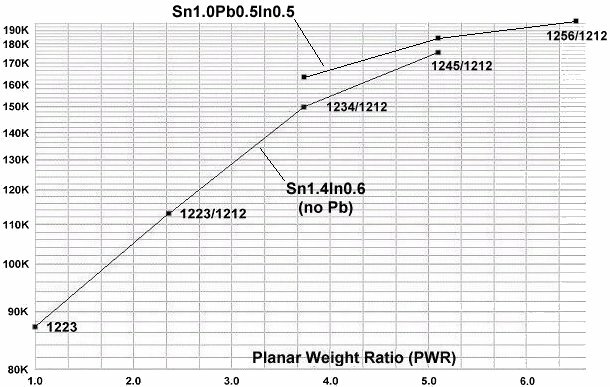 The formula for the 195K superconductor is (Sn1.0Pb0.5In0.5)Ba4Tm6Cu8O22+. Its 1256/1212 structure is shown below left. The plots at page top show the sharp magnetic and resistive transitions characteristic of superconductors. Both plots are composites made from multiple passes that were digitally summed to better resolve the weak 195K signal. When synthesized stoichiometrically, neither the 195K nor 185K superconductor structures will form due to the thulium (and copper) atoms distributing uniformly between the insulating layers. Previously, the most efficient method found to form a lopsided intergrowth was to dope a 1223/1212 host with an extra .06 atom of Tm and Cu. But, even that method produced less than 1% of the desired 1245/1212 phase (185K) and no observable amount of the 1256/1212 phase (195K). With this new method of synthesis, layers of 12x(x+1) and 1212 precursors are alternated in a "layer cake" arrangement before sintering (see graphic above). The "x" represents the larger intergrowth rare earth integer. For example, in the case of a 1245/1212 intergrowth, x=4. Although x=5 also produced a fairly large amount of 1245/1212 material. Each layer was initially pressed at 200 psi. Then, once all the layers were set, the entire pellet was pressed at 70,000 psi and sintered in the UPRIGHT position. When sintered in the "sideways" position, very little of the desired phase forms. This suggests gravity facilitates migration of the heavy thulium atoms. 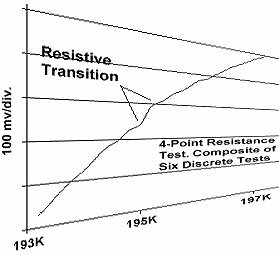 This technique results in the desired phase forming along interference boundaries. The more boundaries, the greater the amount of intergrowth material. With 7 layers (6 boundaries), a 10-fold increase in signal strength was observed over the .06 doping method (as seen below). In addition, a detectable amount of 195K material also appeared. The below plots predicted that there should be a 1256/1212 superconductor with Tc in the range of 190K-200K, based on extrapolation of the top curve. 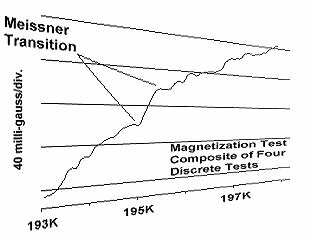 It also suggests a 1267/1212 superconductor may exist, but that its Tc is not much higher than 195K, due to flattening of the curve. This appears to confirm the 1997 prediction by V. Kresin, et al, that the layered cuprates should "max out" at around 200 Kelvin 1. The 195K material is being patented. But the new method of synthesis is being released into the public domain without patent protection. It may be used freely without limitations. When combined with the Tao Electrostatic Separation Technique, this method should be able to produce a near homogenous 195K bulk superconductor. Synthesis was by the solid state reaction method. Stoichiometric amounts of the below precursors were mixed and initially pressed to 200 psi per layer. Then the entire pellet was pressed at 70,000 psi and sintered for 36 hours at 830C in the UPRIGHT position. The pellet was then annealed for 10 hours at 500C in flowing O2. The magnetometer employed twin Honeywell SS94A1F Hall-effect sensors with a tandem sensitivity of 50 mv/gauss. 1) V. Kresin, et al, Phys. Reports 288, 347 - 1997.